Gaza City, Palestine—-As the news of the Flotilla and “Flytilla” bring messages of solidarity to Gaza through the twittersphere I sit overlooking the Mediterranean Sea, almost lying in wait. I’m not the only one. I’m here as part of an artist collective called the “Maia Mural Brigade” in conjunction with the Estria Foundation’s #Water Writes Project and Break the Silence Mural and Art Project and our aim is to collaborate with local artists to paint public murals about water conditions affecting the people of Palestine. We’re lined up to paint 8 murals in the next 7 days on water filtration systems at schools providing potable water for residents of the Gaza Strip. We meet with Dr. Mona El Farra, Director of the Middle East Children’s Alliance Maia (Water) Project, which fundraises for and implements the filters, she is our community liaison here. We sit on her porch and discuss the details—Drinking Mango nectar, eating cucumbers and pita with hummus it’s easy to forget we’re steps away from piles of rubble that were people’s homes before the siege. 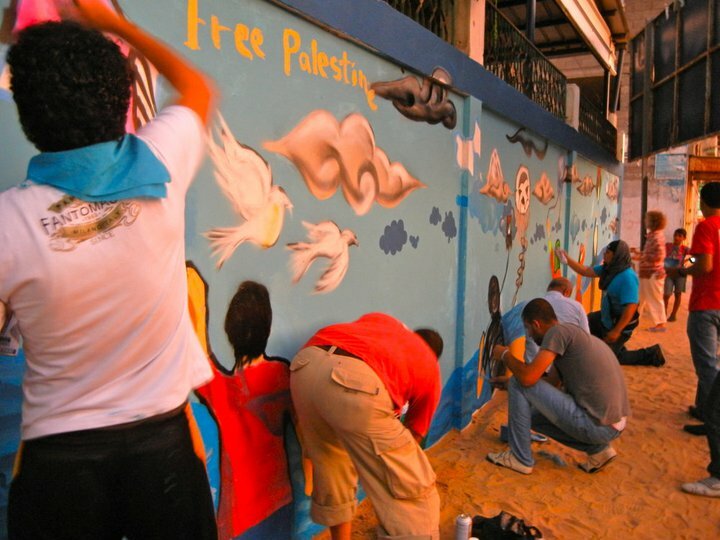 Dr. Mona’s approach is warm, and open, “I won’t tell you what to paint…Artists need have space to fly.” She sends us to schools to gather content for our murals from the children of Gaza. We bring crayons and questions, and leave with drawings and stories. They draw about raw sewage spilling into the sea where the treatment plant stood before the bombs began to fall. They show us sketches of rain and clouds, fishermen and boats, soldiers and warships, drinking water and growing plants. “You can’t separate art from politics” Dr. Mona tells us. So we will paint, knowing that our work will speak to people whose basic needs are not being met. Hoping that our images translate their reality to the world and pull solidarity over the sea. The Flotilla and Flytilla have both been stopped by Israel in one way or another. My colleagues and I are witnessing what the 800 activists and committed cultural workers from across the world were denied the ability to see. As I sit here, in the lobby overlooking the sea. My mind goes to what Ive seen, drawing inspiration for art. Tomorrow we paint, and begin the first in a series of 8 murals. These 8 murals will stand as our statement, we will testify via our craft. Bearing witness to Gaza. The Message: Give these people the water they deserve and need.